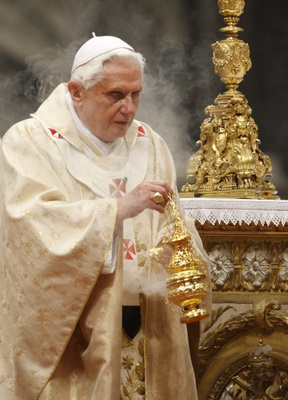 Pope Benedict's Christmas homily: "This child builds his kingdom in every generation from within, from the heart." “You are my son, this day I have begotten you” – with this passage from Psalm 2 the Church begins the liturgy of this holy night. She knows that this passage originally formed part of the coronation rite of the kings of Israel. The king, who in himself is a man like others, becomes the “Son of God” through being called and installed in his office. It is a kind of adoption by God, a decisive act by which he grants a new existence to this man, drawing him into his own being. The reading from the prophet Isaiah that we have just heard presents the same process even more clearly in a situation of hardship and danger for Israel: “To us a child is born, to us a son is given. The government will be upon his shoulder” (Is 9:6). Installation in the office of king is like a second birth. As one newly born through God’s personal choice, as a child born of God, the king embodies hope. On his shoulders the future rests. He is the bearer of the promise of peace. On that night in Bethlehem this prophetic saying came true in a way that would still have been unimaginable at the time of Isaiah. Yes indeed, now it really is a child on whose shoulders government is laid. In him the new kingship appears that God establishes in the world. This child is truly born of God. It is God’s eternal Word that unites humanity with divinity. To this child belong those titles of honour which Isaiah’s coronation song attributes to him: Wonderful Counsellor, Mighty God, Everlasting Father, Prince of Peace (Is 9:6). Yes, this king does not need counsellors drawn from the wise of this world. He bears in himself God’s wisdom and God’s counsel. In the weakness of infancy, he is the mighty God and he shows us God’s own might in contrast to the self-asserting powers of this world. Truly, the words of Israel’s coronation rite were only ever rites of hope which looked ahead to a distant future that God would bestow. None of the kings who were greeted in this way lived up to the sublime content of these words. In all of them, those words about divine sonship, about installation into the heritage of the peoples, about making the ends of the earth their possession (Ps 2:8) were only pointers towards what was to come – as it were signposts of hope indicating a future that at that moment was still beyond comprehension. Thus the fulfilment of the prophecy, which began that night in Bethlehem, is both infinitely greater and in worldly terms smaller than the prophecy itself might lead one to imagine. It is greater in the sense that this child is truly the Son of God, truly “God from God, light from light, begotten not made, of one being with the Father”. The infinite distance between God and man is overcome. God has not only bent down, as we read in the Psalms; he has truly “come down”, he has come into the world, he has become one of us, in order to draw all of us to himself. This child is truly Emmanuel – God-with-us. His kingdom truly stretches to the ends of the earth. 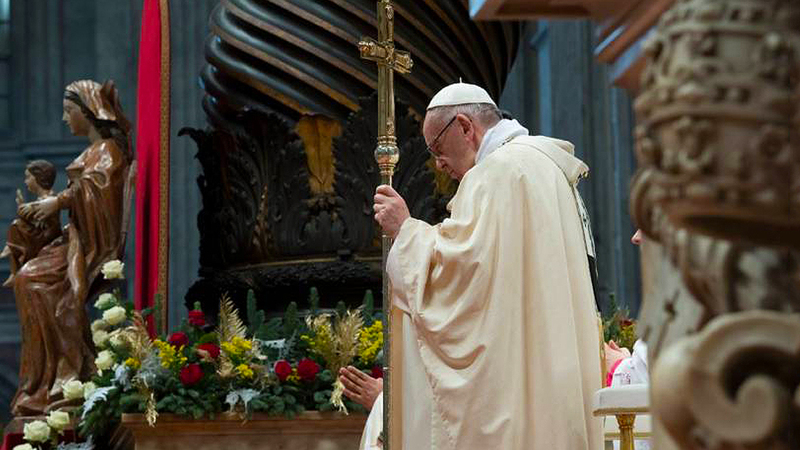 He has truly built islands of peace in the world-encompassing breadth of the holy Eucharist. Wherever it is celebrated, an island of peace arises, of God’s own peace. This child has ignited the light of goodness in men and has given them strength to overcome the tyranny of might. This child builds his kingdom in every generation from within, from the heart. But at the same time it is true that the “rod of his oppressor” is not yet broken, the boots of warriors continue to tramp and the “garment rolled in blood” (Is 9:4f) still remains. So part of this night is simply joy at God’s closeness. We are grateful that God gives himself into our hands as a child, begging as it were for our love, implanting his peace in our hearts. But this joy is also a prayer: Lord, make your promise come fully true. Break the rods of the oppressors. Burn the tramping boots. Let the time of the garments rolled in blood come to an end. Fulfil the prophecy that “of peace there will be no end” (Is 9:7). We thank you for your goodness, but we also ask you to show forth your power. Establish the dominion of your truth and your love in the world – the “kingdom of righteousness, love and peace”. “Mary gave birth to her first-born son” (Lk 2:7). In this sentence Saint Luke recounts quite soberly the great event to which the prophecies from Israel’s history had pointed. Luke calls the child the “first-born”. In the language which developed within the sacred Scripture of the Old Covenant, “first-born” does not mean the first of a series of children. The word “first-born” is a title of honour, quite independently of whether other brothers and sisters follow or not. So Israel is designated by God in the Book of Exodus (4:22) as “my first-born Son”, and this expresses Israel’s election, its singular dignity, the particular love of God the Father. The early Church knew that in Jesus this saying had acquired a new depth, that the promises made to Israel were summed up in him. Thus the Letter to the Hebrews calls Jesus “the first-born”, simply in order to designate him as the Son sent into the world by God (cf. 1:5-7) after the ground had been prepared by Old Testament prophecy. The first-born belongs to God in a special way – and therefore he had to be handed over to God in a special way – as in many religions – and he had to be ransomed through a vicarious sacrifice, as Saint Luke recounts in the episode of the Presentation in the Temple. The first-born belongs to God in a special way, and is as it were destined for sacrifice. In Jesus’ sacrifice on the Cross this destiny of the first-born is fulfilled in a unique way. In his person he brings humanity before God and unites man with God in such a way that God becomes all in all. Saint Paul amplified and deepened the idea of Jesus as first-born in the Letters to the Colossians and to the Ephesians: Jesus, we read in these letters, is the first-born of all creation – the true prototype of man, according to which God formed the human creature. Man can be the image of God because Jesus is both God and man, the true image of God and of man. Furthermore, as these letters tell us, he is the first-born from the dead. In the resurrection he has broken down the wall of death for all of us. He has opened up to man the dimension of eternal life in fellowship with God. Finally, it is said to us that he is the first-born of many brothers. Yes indeed, now he really is the first of a series of brothers and sisters: the first, that is, who opens up for us the possibility of communing with God. He creates true brotherhood – not the kind defiled by sin as in the case of Cain and Abel, or Romulus and Remus, but the new brotherhood in which we are God’s own family. This new family of God begins at the moment when Mary wraps her first-born in swaddling clothes and lays him in a manger. Let us pray to him: Lord Jesus, who wanted to be born as the first of many brothers and sisters, grant us the grace of true brotherhood. Help us to become like you. Help us to recognize your face in others who need our assistance, in those who are suffering or forsaken, in all people, and help us to live together with you as brothers and sisters, so as to become one family, your family. At the end of the Christmas Gospel, we are told that a great heavenly host of angels praised God and said: “Glory to God in the highest and on earth peace among men with whom he is pleased!” (Lk 2:14). 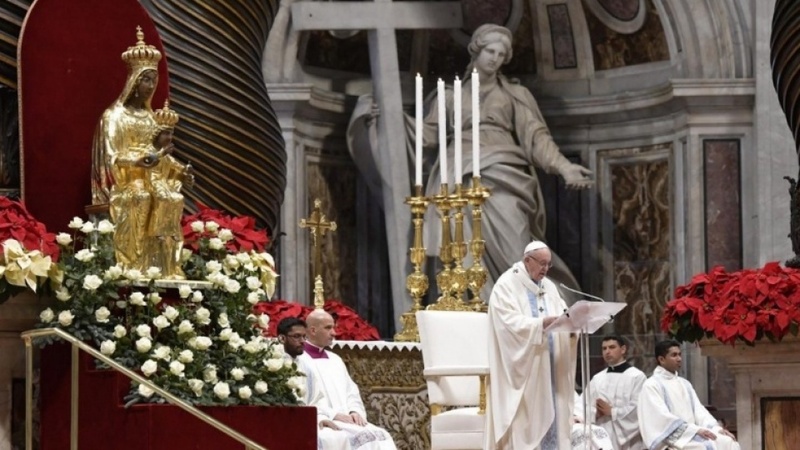 The Church has extended this song of praise, which the angels sang in response to the event of the holy night, into a hymn of joy at God’s glory – “we praise you for your glory”. We praise you for the beauty, for the greatness, for the goodness of God, which becomes visible to us this night. The appearing of beauty, of the beautiful, makes us happy without our having to ask what use it can serve. God’s glory, from which all beauty derives, causes us to break out in astonishment and joy. Anyone who catches a glimpse of God experiences joy, and on this night we see something of his light. But the angels’ message on that holy night also spoke of men: “Peace among men with whom he is pleased”. 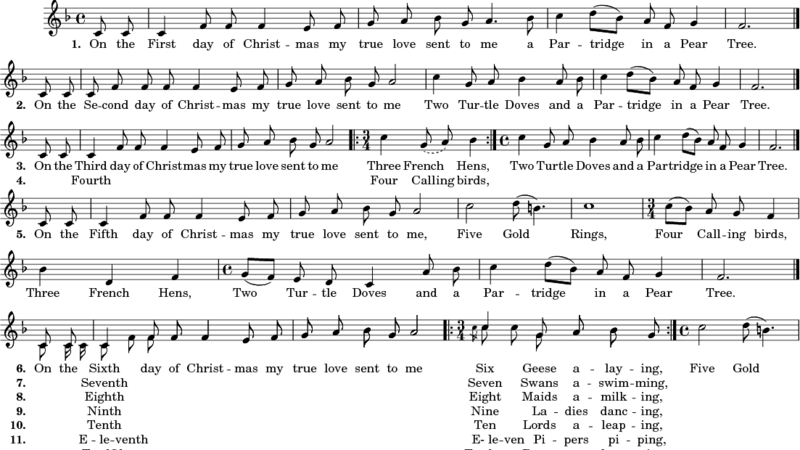 The Latin translation of the angels’ song that we use in the liturgy, taken from Saint Jerome, is slightly different: “peace to men of good will”. The expression “men of good will” has become an important part of the Church’s vocabulary in recent decades. But which is the correct translation? We must read both texts together; only in this way do we truly understand the angels’ song. It would be a false interpretation to see this exclusively as the action of God, as if he had not called man to a free response of love. But it would be equally mistaken to adopt a moralizing interpretation as if man were so to speak able to redeem himself by his good will. Both elements belong together: grace and freedom, God’s prior love for us, without which we could not love him, and the response that he awaits from us, the response that he asks for so palpably through the birth of his son. We cannot divide up into independent entities the interplay of grace and freedom, or the interplay of call and response. The two are inseparably woven together. So this part of the angels’ message is both promise and call at the same time. God has anticipated us with the gift of his Son. God anticipates us again and again in unexpected ways. He does not cease to search for us, to raise us up as often as we might need. He does not abandon the lost sheep in the wilderness into which it had strayed. God does not allow himself to be confounded by our sin. Again and again he begins afresh with us. But he is still waiting for us to join him in love. He loves us, so that we too may become people who love, so that there may be peace on earth. Saint Luke does not say that the angels sang. He states quite soberly: the heavenly host praised God and said: “Glory to God in the highest” (Lk 2:13f.). But men have always known that the speech of angels is different from human speech, and that above all on this night of joyful proclamation it was in song that they extolled God’s heavenly glory. So this angelic song has been recognized from the earliest days as music proceeding from God, indeed, as an invitation to join in the singing with hearts filled with joy at the fact that we are loved by God. Cantare amantis est, says Saint Augustine: singing belongs to one who loves. Thus, down the centuries, the angels’ song has again and again become a song of love and joy, a song of those who love. At this hour, full of thankfulness, we join in the singing of all the centuries, singing that unites heaven and earth, angels and men. Yes, indeed, we praise you for your glory. We praise you for your love. Grant that we may join with you in love more and more and thus become people of peace. Amen.